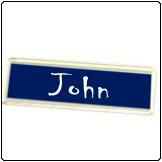 Create your very own name badges using our blank DIY name badges. 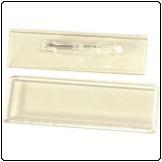 Print your name, image or logo or a piece of paper (Photo paper works best) Cut it to the correct size, put it in the base part of the name badge and clip in the cover to create your own name badge. We only have about 150 left in stock, new stock expected around mid July.